I have always been one of those people about whom others say, "I don't know how you do it all." I definitely fill my plate. It's no different now. Between 2 kids, a full time job, 2 graduate math classes, the blog, and teaching dance, I have a lot to get done each week. And yet, I make it a point to exercise almost daily. 1. Energy: Some people refuse to exercise because they think "I barely have enough energy to get through my day now; I can't waste my energy on exercise." The thing is, exercise doesn't deplete energy, in fact, it increases it. Exercise increases your endorphins which gives you a boost in energy. This boost increases as you make exercise a part of your routine. It can actually become addicting. This makes exercise a great was to start your day. If you are dragging, exercise can give you the boost that you need. 2. Clarity: Exercising in the morning can actually increase you mental clarity throughout the day. It clears away the cobwebs of sleep and allows your mind to focus. Suffering from mom brain? Exercise can help! 3. Efficiency: You might think that taking a half hour to exercise daily takes 30 minutes away from everything else you have to do. Well, as far as actual hours in the day, yes, you will have 30 minutes less. However, exercise helps you become a ton more efficient. You can get more done in less time. Your brain can work on problems while you workout so that when you start your tasks, you can jump right in. No need to stop and think about it. 4. Confidence: Working out is a huge factor in increasing confidence. You don't even have to be at your goal weight yet. Just the fact that you workout enables you to carry yourself differently. You look at yourself more positively, your posture improves, and you feel stronger. Feeling strong and attractive is a huge factor in confidence. 5. Health: Increased health is of course a positive consequence of working out. Having a healthy strong body and healthy weight can decrease your risk of various diseases. It can also help you body defend itself better against infection. You will get sick less, and when you do get sick, it's easier generally to bounce back. 6. Role Model: Aloowing your kids to see you exercise helps you to be a good role model for them. It shows that you value your health and yourself. Exercise shows your kids that making time for yourself is important. It can also can help increase their level of activity. Let them workout with you!! 7. Keep Up with the Kids: Lastly for this list, working out can help you with running after the kids. You will have the strength and energy to play and keep up. You will have the ability to get down and play at their level. You can work to eliminate excuses on why you can't get down there. Your kids will appreciate it. Now the best way to ensure that you get the most out of exercise, is finding an exercise that you love, especially your cardio. Use that to motivate your weight training. For example I love dance as my cardio. Since I want to be able to do some more difficult moves, it motivates me to weight train as well. If you like softball, you can join a team and use that as your exercise. You can use this as motivation for weight training to improve your game. Another way to motivate yourself is to set a goal. Sign up for a 5k or half marathon and workout to prep for that. Find something you enjoy so that you keep doing it. So here we are are at 2.5 weeks post partum. While sleep is still less than abundant, everyone is adapting to the new schedule. Hailey is growing, and T is learning how to be a big brother. Some days are too exhausting to think about exercising and others I just want to jump back in the saddle and get me pre-pregnancy body back. There are two important things to remember as you start to get back into your fitness regimen. The first is to start back slowly. Even on the days where you feel relatively more energized, it's important to remember that your body performed a momentous feet and it needs to recover. It's important to gradually increase your exercise regimen. You can plan it out. Start with walking, then maybe light yoga and then light weights. You can gradually increase intensity until you are back where you were pre-pregnancy and then beyond. This is a time when you really need to listen to your body. You may feel fine and then end up pushing yourself too far. This can do more harm than good. Take things day by day. Remember you are running on reduced and oft interrupted sleep. The best thing is to eat well, get as much sleep as possible and slowly increase activity. The second thing you must consider is your abs. This is probably the area you want to concentrate your efforts, but there is a lot to consider. First off, it takes a while for your uterus to shrink back to its normal weight. By four to six weeks, it should be close to its pre-pregnancy weight of about 2.5 ounces. This process is called involution of the uterus. So some of the excess bloat may be your uterus still not back in your pelvis. Even after your uterus shrinks back into your pelvis, you may continue to look somewhat pregnant for several weeks or longer. That's because your abdominal muscles get stretched out during pregnancy, and it will take time – and regular exercise – to get your belly back in shape. However, before you start packing in the crunches, there is another issue to consider. Diastasis recti. Diastasis recti is commonly defined as a gap of roughly 2.7 cm or greater between the two sides of the rectus abdominis muscle. This is common following pregnancy. Doing the wrong kind of ab exercises can increase the gap. In fact, crunches are one of the exercises you should not do if you have this problem. To check if you have diastasis recti, lie on the floor as if you were going to perform a crunch with your knees bent and feet on the floor. Lift your head off the floor and place your fingertips on the center of your abs to check for a gap. This is also something that can be check by your doctor. The following are exercises that can help strengthen your ab muscles and reduce diastasis. Note that these exercises involve the pulling together of your ab muscles as opposed to crunches which push them out. Core contraction - In a seated position, place both hands on abdominal muscles. Take small controlled breaths. Slowly contract the abdominal muscles, pulling them straight back towards the spine. Hold the contraction for 30 seconds, while maintaining the controlled breathing. Complete 10 repetitions. Seated squeeze - Again in a seated position, place one hand above the belly button, and the other below the belly button. With controlled breaths, with a mid-way starting point, pull the abdominals back toward the spine, hold for 2 seconds and return to the mid-way point. Complete 100 repetitions. Head lift - In a lying down position, knees bent at 90° angle, feet flat, slowly lift the head, chin toward your chest, (concentrate on isolation of the abdominals to prevent hip-flexors from being engaged), slowly contract abdominals toward floor, hold for two seconds, lower head to starting position for 2 seconds. Complete 10 repetitions. Upright push-up - A standup pushup against the wall, with feet together arms-length away from wall, place hands flat against the wall, contract abdominal muscles toward spine, lean body towards wall, with elbows bent downward close to body, pull abdominal muscles in further, with controlled breathing. Release muscles as you push back to starting position. Complete 20 repetitions. Squat against the wall - Also known as a seated squat, stand with back against the wall, feet out in front of body, slowly lower body to a seated position so knees are bent at a 90° angle, contracting abs toward spine as you raise body back to standing position. Optionally, this exercise can also be done using an exercise ball placed against the wall and your lower back. Complete 20 Repetitions. Squat with squeeze - A variation to the "Squat against the wall" is to place a small resistance ball between the knees, and squeeze the ball as you lower your body to the seated position. Complete 20 repetitions. As for myself, I have started walking regularly and doing squats and non weighted arm exercises. I do kegels a few times a day and am starting to incorporate some of the above abdominal exercises. 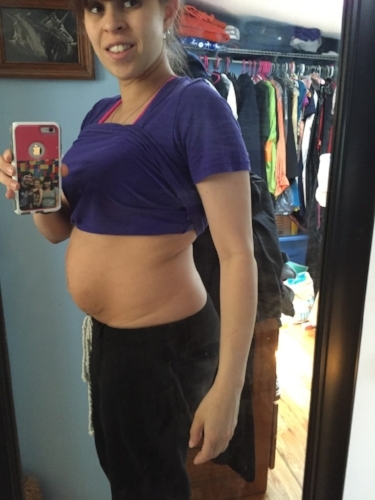 Below are a few pictures of my belly progress. Here's a reminder of last time. This is definitely a case of slow and steady wins the race. The next update will probably be in a few weeks. A) so there is more progress and B) so we can get back to more time management organization type posts. As a busy mom, sometimes its hard to take time out for yourself. We have so many other obligations and priorities that we sometimes put ourselves last. Other times, the way that we treat ourselves in not the best or healthiest. Our "me time" becomes have a sugary or salty treat in front of the TV after the kids are in bed. But, in order to be our best selves and the best possible mom, we have to put our own health as one of our top priorities. Exercise can give you a high and give you energy to start your day. It can help you clear your brain and enable you to focus. It can give you the strength and endurance to get through a long day. It keeps you healthy and your heart pumping. It boosts your mood. If nothing else, it helps you shed unwanted lbs. 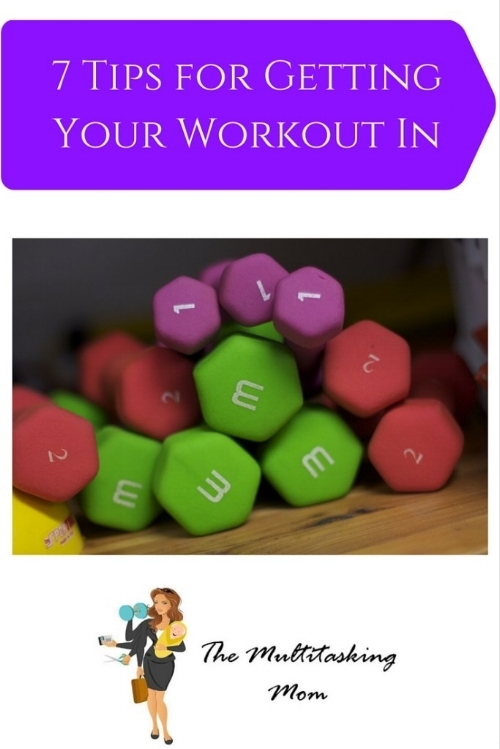 So here are 7 tips to help you ensure that you get your workout in! 1. Have a goal of working out everyday - but don't be hard on yourself. On average, you want to work out around 5 days a week. Some people schedule their rest days. I'm not one of those people. I find that if you schedule your rest day and then something comes up another day that prevents you from working out, you beat yourself up for missing an extra day. I make my goal to work out daily and if something does come up or I'm not feeling well, I count that as my rest day. This enables you to have a lot less guilt. 2. Workout in the morning - I find that the best time to workout is before anyone else gets up. This means I'm up at 6:00 am, have a protein shake and start my workout. I generally don't have scheduling conflicts at this time and things don't generally come up. Therefore, it is a whole lot easier for me to make sure I get my workout in. I also have the living room to myself (aside from the dogs) so I can spread out and make as much noise as I want. 3. Workout at Home - Going to the gym is nice, but it requires a lot of effort and planning. You need someone to watch the kids, you have to pay a membership whether you get to the gym or not, you actually have to take the time to go there and come back on top of your workout time, and you have to wait for equipment or come early to make sure you get your spot for class. At home, these things are not an issue. A 30 minute workout will actually take 30 minutes. Once you have your equipment, there is no additional cost. And, no babysitter is required. 4. Have your equipment easily accessible - Set aside a space in your home where you will workout. This might be your living room or your basement or the garage. Have all of your workout out equipment all together, easily accessible in this room. I workout in my living room, so in one corner I have my weights, my stretch band, my ball, my yoga mat and my fold away elliptical. I also have one location for all of my fitness DVDs. When I want to workout, I just grab the equipment I need for that workout and I'm ready to go. 6. Get your kids involved - If you have a teeny guy or gal, do baby wearing workouts where you do exercises while wearing your baby in their carrier. The baby is your weight and you move up in weight as your baby gets bigger. This is actually fun for the baby too and some good quality time together. For bigger guys (depending on how big) you can still use them as your weight. Toddler chest presses and over head presses anyone? How about a plank with a toddler on top? Squats while carrying your little guy! Workout with your hubby and get everyone involved. For even bigger kids, get a couple light weights and encourage them to join in. It's never too early to develop a healthy lifestyle. 7. Set a workout goal - When you have a goal to achieve you are much more motivated to do the work it takes to get there. Decide you want to be able to do 60 squats in a minute, or drop a dress size in 4 weeks, or get through the whole workout DVD without having to hit pause. Wherever you are fitness wise, there is always a new goal you can set. Make your goals specific and achievable. Not easy, but achievable. You want to obtain your goal, not be depressed when your deadline comes and you fall short. In the end, working out is super important to being the best mom you can be. You have energy to chase and play with your kids. You model a healthy lifestyle. And you will definitely feel accomplished when you finish a good workout. Try to add workouts to your routine little by little and you will definitely notice the difference in all aspects of your life. In fact, with that extra boost of energy you may find you actually save time in your day because you are able to accomplish things faster and more efficiently. Here's to healthy, happy mommies! !